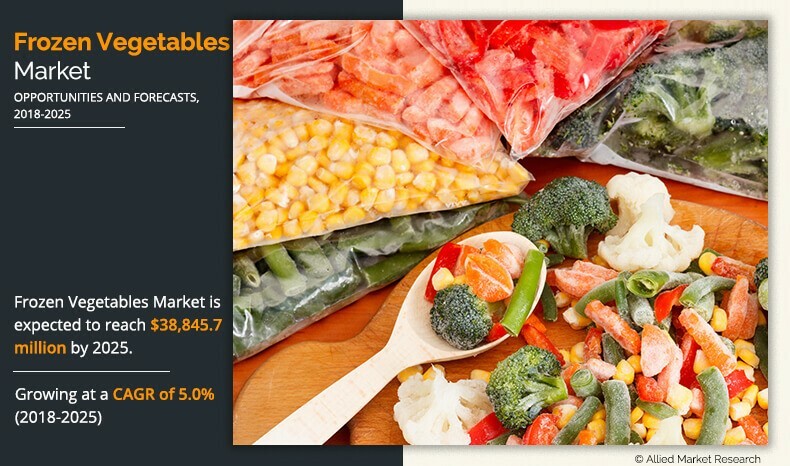 The frozen vegetables market was valued at $26,479.0 million in 2017, and is expected to garner $38,845.7 million by 2025, registering a CAGR of 5.0% from 2018 to 2025. Deep frozen vegetables are products that can be stored and used over a long period of time. Freezing helps to retain the essential nutrients in vegetables, such as carotenes, which are essential to synthesize vitamin A in the body. In addition, to avoid food wastage, meet the needs of rising population, and keep the food businesses competitive & profitable, preservation of food by freezing is adopted by various food manufacturers. Increase in demand and consumption of frozen foods in the emerging markets of Asia-Pacific such as India and China has significantly fueled the growth of the global frozen food market. Rise in disposable income and change in lifestyle & food habits further boost the market growth. Moreover, rapid increase in number of large retail chains, including hypermarkets and supermarkets, propels the demand for frozen vegetables. Growth female workforce has increased the dependency on readymade and convenient food products, which in turn increases the demand for frozen vegetables, thereby accelerating the frozen vegetables market growth. However, consumer perception about low nutritional content in frozen foods and lack of proper refrigeration facilities in semi-urban & rural areas restrain the growth of the market. 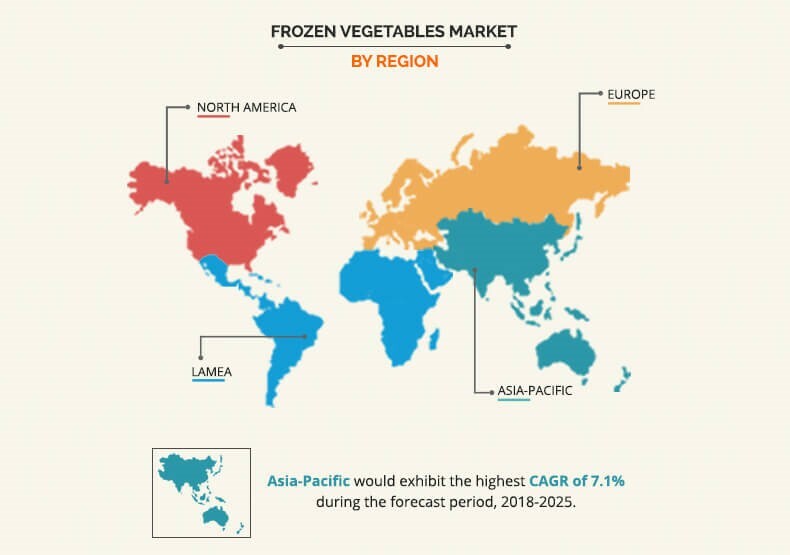 On the contrary, advancements in freezing technologies are expected to provide lucrative opportunities for the frozen vegetable market growth. 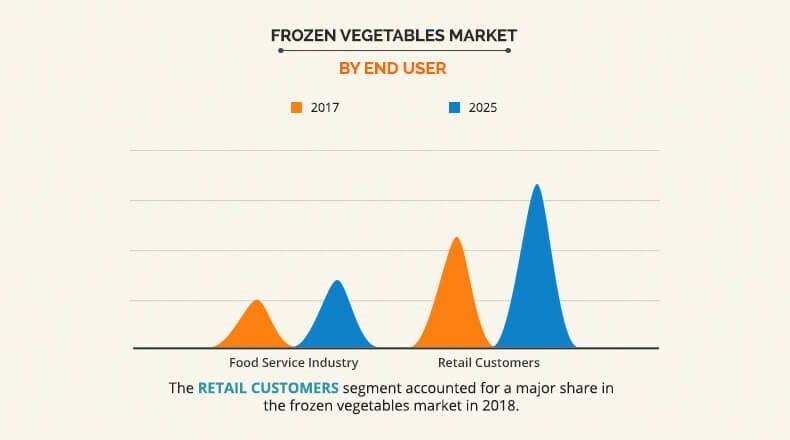 The global frozen vegetable market is segmented based on product, end user, distribution channel, and region. On the basis of product, the market is divided into asparagus, broccoli, green peas, mushrooms, spinach, corn, green beans, and others. In terms of end user, it is bifurcated into food service industry and retail customers. By distribution channel, it is categorized into discounters, supermarkets/hypermarkets, and others. Region wise, it is analyzed across North America, Europe, Asia-Pacific, and LAMEA. In 2017, the corn segment had the highest share in the frozen vegetables industry owing to the easy availability of corn all over the world and high application of corn and corn-based food items in quick service restaurants and food outlets. The broccoli segment is expected to witness the substantial growth with CAGR of 7.1% throughout the forecast period due to rise in the trend of health and fitness among consumers worldwide. The mushroom segment is expected to grow at a modest CAGR of 1.72% owing to low consumption of mushrooms. However, increasing consumption of mushrooms in the quick service restaurants and food outlets may provide ample opportunities in the coming future. In 2017, the retail customer had the highest share in the end user segment in the frozen vegetables market. This was due to the factor of immediate gratification and the option of trail before purchase. The food service industry is expected to witness a moderate growth rate of 4.7% during the forecast period owing to the increase in the number of fast food outlets and quick service restaurants all around the world. In 2017, the supermarket/ hypermarket dominated the distribution channel segment in the frozen vegetables market because these retail formats provide an augmented shopping experience. Moreover, these retail formats provides a one-stop solution to a number of shopping needs which further boosts their popularity in the world market. The other segment which includes convenience stores, and mom & pop stores is expected to witness the steady growth rate during the forecast period owing to increasing number of convenience stores. Also, convenience stores and the mom and pop stores are usually located near residential areas and require less effort from the consumers side when purchasing goods. This ease of purchase adds to the popularity of others segment and act as a driver for the global frozen vegetables market. In 2017, Europe and North America collectively contributed over half of the global market share in the frozen vegetables market, where the former accounted for 39.6% of the global frozen vegetables market share. However, Asia-Pacific is expected to grow at the highest CAGR of 7.1% throughout the forecast period. 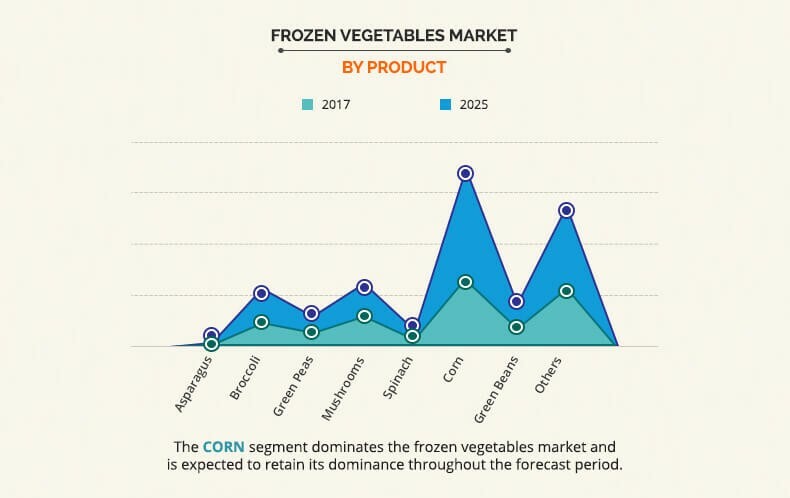 The key players in the frozen vegetables market focus on new product launch as the prominent strategy to improve product portfolio, overcome competition, and maintain or improve their share in the global Frozen Vegetables market. The key players profiled in the report include Aryzta AG, General Mills Inc., Kraft Foods Group Inc., Ajinomoto Co. Inc., Cargill Incorporated, Europastry S.A., JBS S.A., Kellogg Company, Nestle S.A., and Flower Foods. The report provides a quantitative analysis of the current frozen vegetables market trends, estimations, and dynamics of the market size from 2018 to 2025 to identify the prevailing market opportunities. 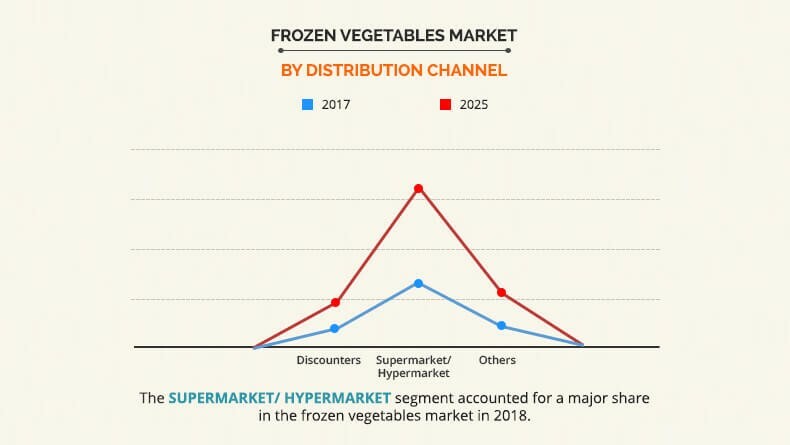 In-depth analysis on the frozen vegetables market size and segmentation assists in determining the prevailing frozen vegetables market opportunities. The report includes revenue generated from the sales of frozen vegetables and the frozen vegetables market forecast across North America, Europe, Asia-Pacific, and LAMEA. The report includes the frozen vegetables market analysis at regional as well as the global level, key players, market segments, application areas, and growth strategies. Frozen vegetables are products that can be stored and used over a long period of time by keeping the temperature below their freezing point. Based on the interviews of various top-level CXOs’ of leading companies, foreign direct investment (FDI) has led to rise in the participation from foreign and private players, which is expected to boost the retail industry. This in turn is expected to significantly contribute toward the growth of the frozen vegetables market. As countries in Asia-Pacific, such as China and India, are undergoing infrastructural development with better and advanced connectivity, retail shops are witnessing transition in terms of storage facility and inventory. With increase in per capita income, changes in consumer profile, and upsurge in female working population, developing markets are expected to emerge as major markets for frozen vegetables. Rise in global population and growth in number of QSRs such as McDonalds, Burger King, Wendy’s, Subway, and Dunkin’ Donuts further drive the market growth. However, as per CXOs’ perspectives, negative consumer perception related to nutritional content in frozen vegetable and poor freezing facilities in semi-urban & rural areas are projected to hamper the market growth.